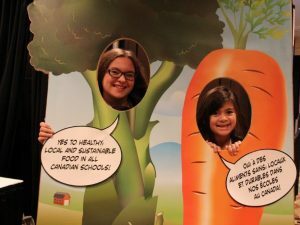 Nourishing School Communities brought together partners from across Canada with the vision to get more healthy and local foods into the minds and onto the plates of school children. The objective of this evidence-based initiative was to implement, scale up and evaluate best practices by guiding school communities to create healthy school food environments. With three years funding from the federal government through the Canadian Partnership Against Cancer’s Coalitions Linking Action & Science for Prevention (CLASP) program, Nourishing School Communities provided $2.4 million to various programs across the country. 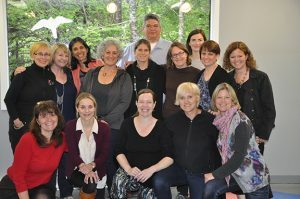 Working hand in hand with multiple partners at provincial and local levels, seven national partners led this work including: Heart & Stroke, Farm to Cafeteria Canada, YMCA Canada, Federation of Sovereign Indigenous Nations, The Lunch Lady Group Inc., University of New Brunswick and the Propel Centre for Population Health Impact. 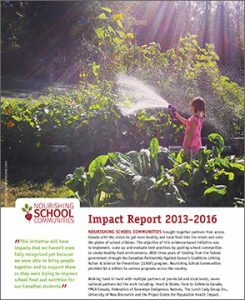 Nourishing School Communities made transformative changes to school and after-school food environments across various programs over the three-year period. Each program worked with multiple partners towards a common vision in complementary and unique ways. These partnerships also facilitated communications and sharing across established school food programs and networks. Together this initiative supported changes that aimed to shift policies and practices in ways that make healthy local foods easier to access and fun to eat. Nourishing School Communities was successful in creating environments where healthy local food was encouraged, supported and celebrated. 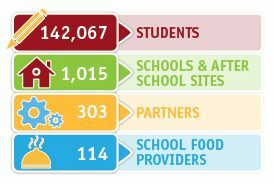 Across this country, thousands of people are championing a new and improved ‘menu’ for school food and we are excited to see the Nourishing School Communities partners leading as a catalyst for future action. The Lunch Lady Foundation was officially incorporated in March 2017. They are currently offering operational support in an advisory capacity, to the Meal Box Program in Toronto. The Learning Circle: Local Healthy Foods to School initiative is expanding to four Indigenous communities with a three-year project funded by the Canadian Institute of Health Research (CIHR) through its Pathways to Health Equity for Aboriginal Peoples initiative.